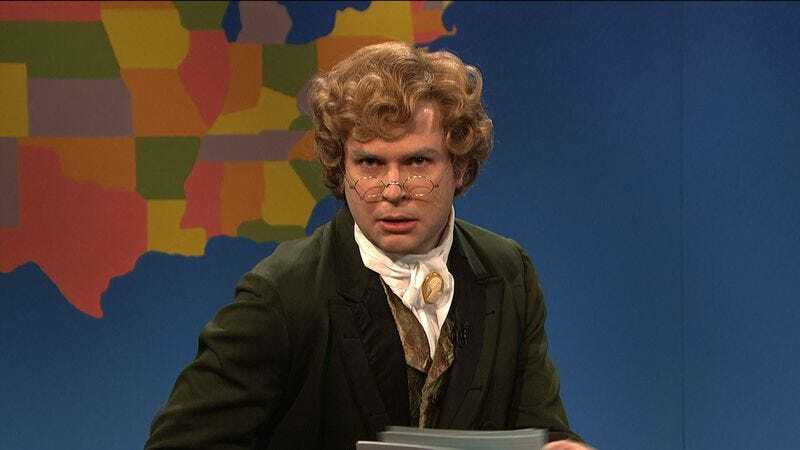 In accordance with the contract signed in blood, in the ritual chamber deep beneath 30 Rockefeller Center, Saturday Night Live cast member Taran Killam has heeded his master’s call and will appear in a new Lorne Michaels movie. Called Brothers In Law, the movie is produced by Michaels and directed by SNL segment producers and Funny Or Die regulars Matt Villines and Osmany Rodriguez. In keeping with his tradition of supporting young talent (“But at what cost?” Brooks Wheelan murmurs. “At what cost?”), Michaels commissioned up-and-coming screenwriter Cameron Fay to write the script, with rewrites from Killam and SNL writer Mikey Day. As for what the movie is actually about, Variety describes it as “having elements of Meet The Parents and What About Bob?,” probably meaning that somebody’s getting married and one kooky relative or another is not having it. Bill Pullman, Rita Wilson, Bobby Moynihan, David Wain, and Rachael Harris round out the cast.